Penny and I, well mostly Penny, are trying to get a charity group together up here in the Northeast Corner of MS. I am guessing that it will probably be based out of Tupelo. Right now we are focusing on loomers, but it will probably expand on to ANY craft that can be donated or auctioned off for charity. I think for now the focus is on hats for St. Jude and LeBonheur (did I spell that right?) And blankets, too. But hopefully we can expand as needed. If any of you are interested PLEASE LET US KNOW!!!! Right now it is just the two of us and that is why we need more people. Oh, and you can visit Penny HERE. I say that she is doing most of the work b/c she truly is. She is way more organized than I and I think she knows a lot more than I do on how to go about this. 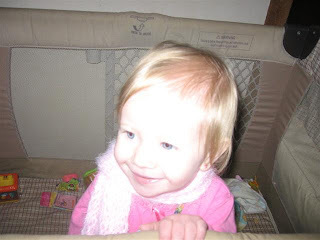 I feel like I am just along for the ride for now, but really REALLY want to help her out! I feel like I have accomplished nothing today. 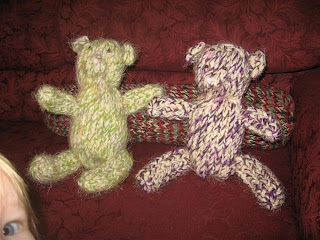 I was supposed to ‘get looming’ as my hubby told me to do (imagine that! He didn’t say to do the dishes or clean up the living room, but to get looming. Haha! 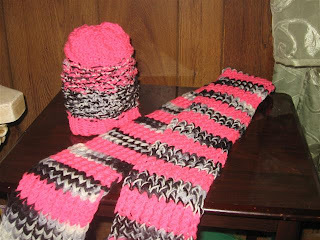 Just so I can finish up what I have on my to do list so that I can make the hat and scarf for an employee, I am sure. I’ll get to it!) Anyway, I finished up an ‘Imperfectly Perfect Bear’ last night. He is green and white and I named him Gulliver. I decided to do the two days worth of dishes this morning and I am currently working on Gulliver’s sister, Rosa. She only has a body and arms right now, so I just have to do her legs and ears, then she will be ready to go. 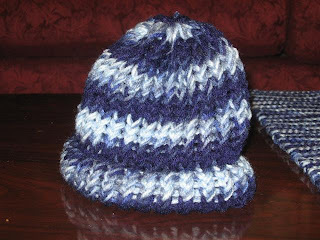 After that, I am working on two adult male hats. I want to use some of the patterns in my head for them. I need to graph the designs out to make sure it will work and then loom them up and take pics of them. 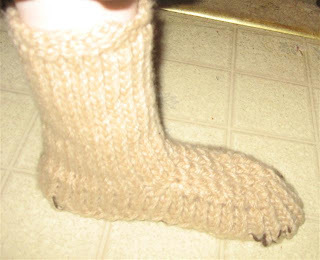 Hopefully it will show up with the black yarn I plan on using, but something tells me it won’t. 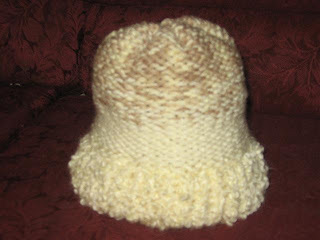 I can’t wait to get the kinks worked out on my hat patterns so that I can start selling them. Me and the kids are under the weather. Have been for the past couple days. Just sinus issues. The kids only have runny noses but me….oh I have to feel like I am knocking on Death’s door. Sneezing, burning throat, pressure in my forehead that makes me feel like I am crossing my eyes and I can’t think straight. I figure it will just be easier to put all of the pics in ONE BIG POST! Easier for ya’ll to see them all and easier for me to add them all. 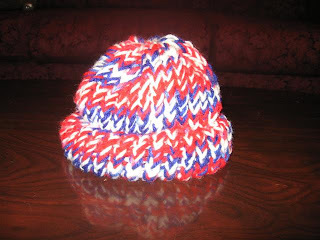 So, let’s get started: This hat was made using a blue variegated Red Heart Super Saver and it was my very first project. It was supposed to be for my 2 yo ds, and I followed the recommendation of using the red KK loom for ‘small children’ only to discover that it was WAY too small. So my nephew (was unborn at the time) recieved it instead. 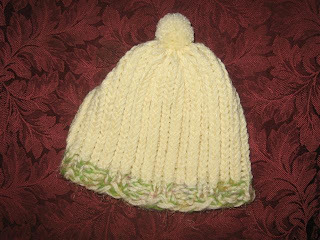 Then I bought my ds some more yarn of his choice and attempted to make him a hat on the green KK but shorter than I would for myself. It turned out a bit too short, so off to my newborn nephew it went! 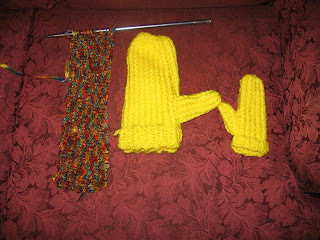 I decided to try out a mitten pattern that said it would fit an adult female, older child, and smaller child….but it never gave the adjustments for the older and smaller child. I made the mitten up and it was HUGE! Like my dh’s big club-like hands fit in it fine. I decided it makes a great dust mitt and I can use the other side of it for polish. LOL! 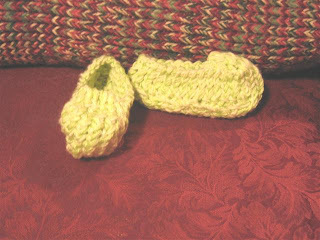 I attempted to use the same pattern and make a smaller mitten, but it was too small for 2yo ds. I gave up. Next came the magic scarf I made for dd to match the one I had purchased for myself 2 years ago. She is already a yarn-a-holic and snatched up this wonderfully soft Moda Dea Dream yarn at Hobby Lobby for $.71 a ball. 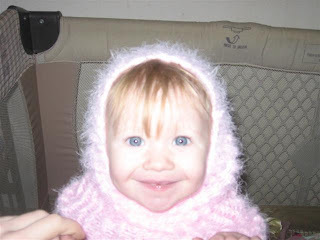 I knew right away that I wanted to make her the magic scarf to match Mom-O’s! I worked on a woven ribbon scarf (pattern found at http://www.provocraft.com/ ) but don’t really like how it turned out. Next time I will make it a lot longer and skinnier. I created the hat design to match it since I wanted to gift them to one of my best friends for Christmas! 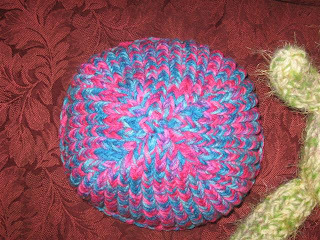 I made a fun colored hat for a lady that goes to church with my MIL. 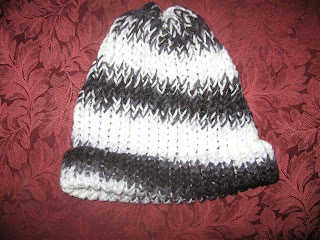 This was my first time finishing off a hat in four decreased sections. 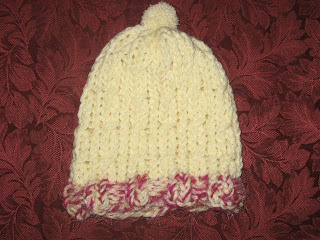 Nicole loves it and I actually got an order to make 2 more hats b/c of it. 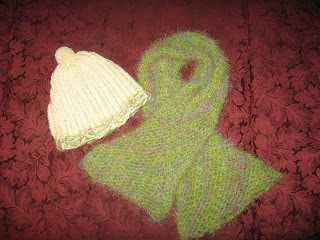 Next project was a spiral ribbed hat and a double knit scarf for another friend. 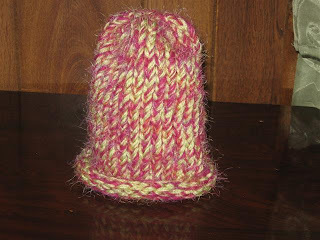 Note to self, use a plain color for spiral ribbed hats! 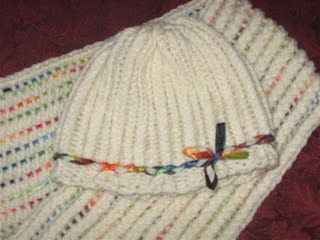 Then I made my first cabled project. 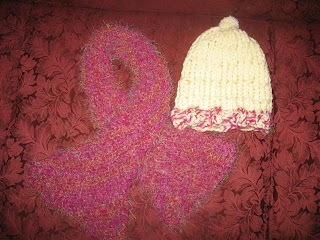 A cable hat and magic scarf for one of my nieces, Molly. 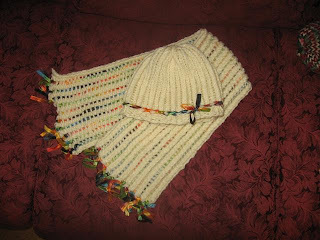 And a magic scarf and what I call the single and double stitch ribbed hat for another niece, MaryAnn. 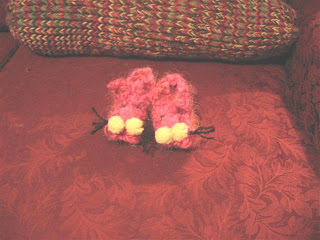 I worked on some slippers for my kids. 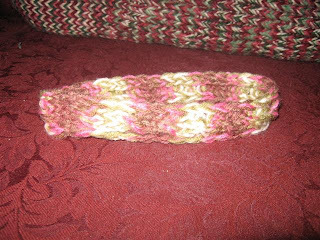 Then a headband for myself. It has cables but you can’t see them too well. 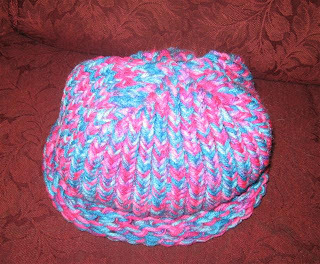 I call this hat ‘Toasted Marshmallow’ and it was for my MIL for Christmas. This hat was for my FIL. 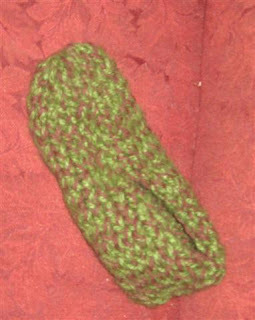 I call these slippers ‘Grouch Man’ slippers b/c they remind me of Oscar the Grouch. My hubby got them for Christmas and wears them daily. He says that they are really warm. 😀 That makes a woman proud! 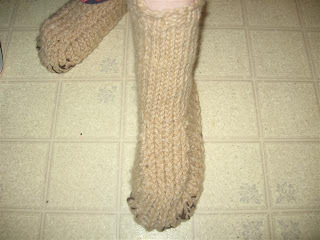 And I became obsessed with an Old Navy commercial (for $15 items) that had a pair of boot slipper thingies and made up a prototype. They aren’t overly difficult, but they ARE NOT for mere beginners. 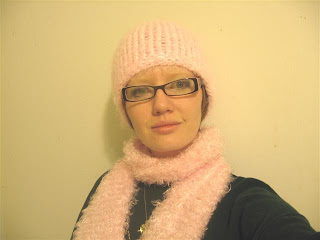 The last thing I have completed is a hat out of the Moda Dea Dream to match my scarf and I will use the left over for my dd so that we can be twinkies! I am currently moving all of my info from http://mrs.robinlmccoy.googlepages.com over to here b/c the previously mentioned site can be pretty temperamental about saying that pages can’t be found by the public user but I know that they are there and published and perfect. Oooooooh, weeeellllll! We’ll just start anew and give it a different feel, shall we?! So, I hope that everyone bookmarks my page (and possibly links it on their own blog like I tend to do so many others). Let me know if there is anything that you think might need some attention or changing!